To schedule a session for your school, please contact Tayte (below). The next public session is scheduled for September 26, 2018 from 5:30 p.m. to 8:30 p.m. at Murchison Centre in Charlottetown. Pre-registration is required by contacting the program contact. 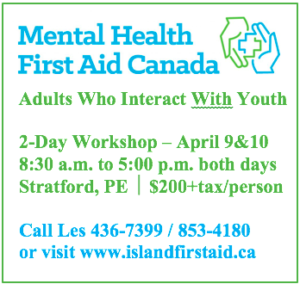 Mental Health First Aid (MHFA) for Adults who Work with Youth – is the help provided to a youth developing a mental health problem, experiencing the worsening of an existing mental health problem or in a mental health crisis. Just like physical first aid is provided until medical treatment can be obtained, MHFA is given until appropriate support is found or until the crisis is resolved. Please visit www.islandfirstaid.ca for a course calendar and to register. For more in-depth information about Mental Health First Aid, please visit www.mentalhealthfirstaid.ca. Cost of the workshop is $200 + tax/person and includes snacks and materials. Lunch is not provided. Registration can be completed at https://islandfirstaid.ca. There are a number of other opportunities to learn more and develop new skills through our education and training programs. Please click HERE for a complete list of what we offer. If you’ve got a student or kid on your team that is struggling, self-help groups might be a good avenue. There are a number of self-help groups across the island that we support. There are some targeted to youth and some groups that might be a good resource for parents. Participating in self-help offers social support, relief from isolation and provides education and practical information. Most importantly, participants know you’re not alone because they’re surrounded by others with similar struggles and experiences. Click HERE for a complete list.